In the first part of my umpeenth focus on Songdo and the Seoul DMC ("Songdo, DMC: sequence is of the essence (Part I)"), I insisted on symbols, images, concepts, purpose. Here, I linger on space and time, key dimensions of urbanism and architecture, where consistencies or discrepancies resonate. Of course, urbanism and architecture are foremost about humans, and when that small detail is not at the center of preoccupations, it shows. 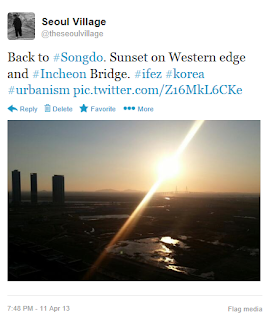 NB: again, Songdo and the DMC cannot be compared (e.g. scale, timelines, stakes, relative importance for local authorities...), and they don't compete directly. This is not a comparison but a parallel update, with random thoughts about the evolution of ambitious urban projects. UPDATE: download the whole focus in PDF format here. Once more, these "Ubiquitous" cities are not yet "All Over The Place", and work is still in progress, so be patient! 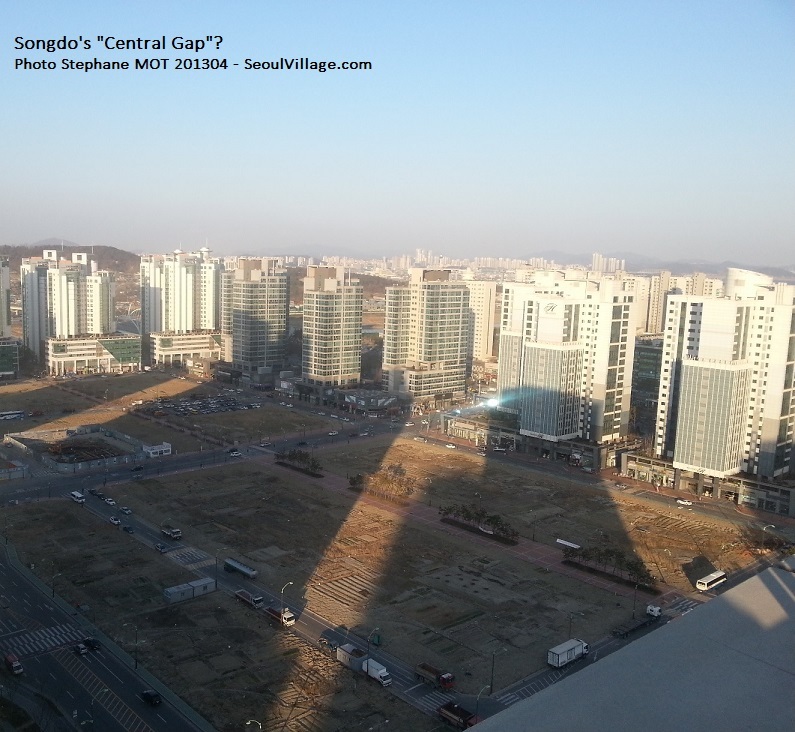 One of Songdo's "Central Gaps". This block will soon be filled with low rise commercial buildings and shops. One of the DMC's few remaining blind spots last year, along Digital Media street. 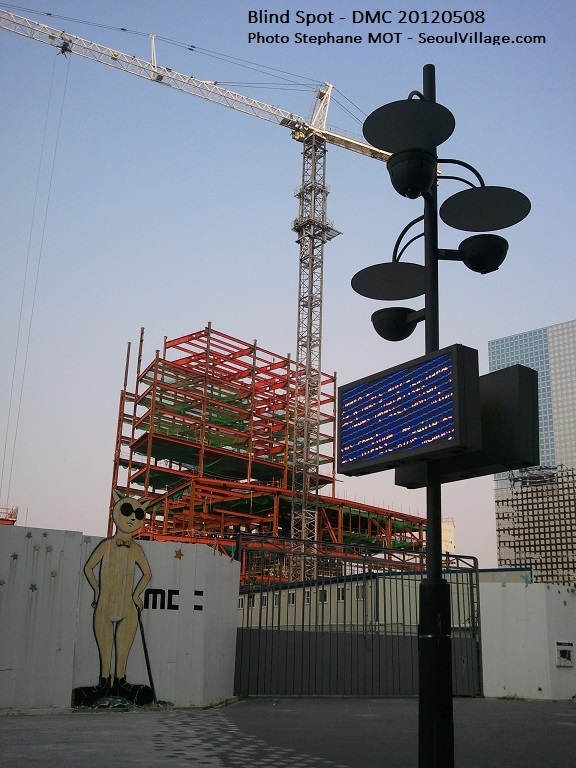 This LED screen caught a bug, but the artwork is blind anyway. But before exploring these new cityscapes, let's see how they integrate to their surroundings. If both Songdo and the DMC are connected to Incheon and Gimpo airports as well as to their respective urban environments, some key connectors show a bit too much, and seamlessness or urban continuum were not always top priorities. According to the IFEZ master plan, Songdo will reach for Ansan and Incheon's old harbor, while growing a new one. But the IBD has yet to fill all the parts where earthwork has already been completed. 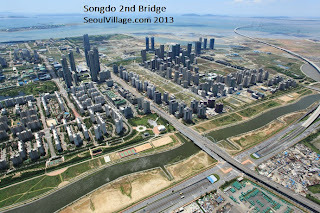 Songdo IBD will eventually become a peninsula connected to Sinheung-dong to the north (when District 9 is completed), and firmly anchored to its surroundings through 6 bridges, not to mention of course the spectacular Incheon bridge, a direct link to Incheon Airport. On its northwestern side, it almost touches Dongchun-dong along Saeachim Park (New Morning Park), a promising promenade with a narrow waterway and two mini "mountain chains" in the background (Cheongryangsan-Munhaksan, Songdo's skyline). - Instead of camouflaging the beefed-up Aam-daero, open air lanes have been added to further separate Songdo from Dongchun-dong and the future Paramount Movie Park Korea. Even if bike lanes have been laid out, cars rule overwhelmingly. - Incheon Bridge ends in two concrete ribbons blotting out the scenery: Incheondaegyo Expressway (Highway 110) and Songdo Haeandoro (3rd Gyeongin Expressway along coastal road 77). The 2nd Seoul outer beltway will soon stretch new tentacles over the ocean, making sure the future Incheon New Port is itself cut from the rest of the IBD. - This at a time when Seoul bitterly regrets the concrete monsters that disfigure some of its cutest waterways. This at a time when Paris starts covering its belt highway "Peripherique" to improve the osmosis with its direct urban environment, and considers doing the same around its La Defense business district. This at a time when Seoul thinks of ways of hiding the expressways separating Han riversides from the rest of the city... Again, highways don't belong in sustainable cities, and elevated roads are supposed to be patches you use when urban planning failed, the worst possible solution when you start from scratch. New roads should alleviate traffic, not cause more problems and create more demand for cars. From a distance, Songdo looks as highway-and-car-friendly as L.A.
Songdo meet Brughel meet a great Korean classic: the elevated highway. Note that subway-wise, the aerotropolis is directly connected to the old Incheon center, but not to the airports: the Incheon Bridge was not doubled with railways, and you have to reach the AREX at Gyeyang Station, at the other end of Incheon Subway Line 1. That's not a long trip, but you draw a "seven" 3 to 4 times longer than the Incheon Bridge's straight line. And if the Suin Line will complete the Suwon-Incheon loop by 2014 (joining Songdo Station to Incheon Station), Songdo IBD hangs by itself at the end of the Line 1 hook. More stations are planned, but for the next one we might have to wait for the Songdo Incheon Tower, and the construction of the business center on the other side of Canal Walk has been postponed. For the moment, Songdo has to do all the pushing, whereas it should be more a win-win, push-and-pull game with surrounding areas. Typically, the synergies between the IFEZ's 3 sub-projects (Yeongjong-Songdo-Cheongna) and the rest of Gyeonggi-do would be boosted if there were a coastal vertical connecting Cheongna, Incheon's Jung-gu, Songdo, and Siheung-Ansan. That's the role of the future 2nd Seoul outer beltway, but ideally, the vertical should also exist in a railway version. BTW I'm glad that they eventually decided to build a AREX Cheongna Station, but I still can't believe it was not planned from the start - as if the AREX and IFEZ projects existed in different galaxies! As a matter of law, I think no New Town project should get any authorization if there's not at least one subway connection from day one, and Subway Line 1 reached Songdo only in 2009, four years after the delivery of the first blocks (district 2). - To the South, the block is separated from the Han River and its riverside park (Nanji Park) by the Gangbyeon Expressway and its 10 lanes of traffic. Also known as Jayuro or "Freedom Expressway", Gangbyeon runs along the Han River all the way to Paju, and connects the capital to Gimpo and Incheon airports. Note that unlike Songdo, the DMC is directly connected via AREX to both airports. Actually, at one stage, the Seoul Lite landmark tower was by itself meant as an all inclusive, miniature aerotropolis for business travelers. It a good thing that this anti-city scenario was dropped. - To the North, a disgracious urban separator prevents the DMC from dialoguing with Susaek-dong and Eunpyeong-gu: the Gyeongui Line. Seoul city considers burying it, but it will take time and here, it's as wide as around Seoul Station. And it's doubled with yet another major entry point to Western Seoul: a 6-to-8-lane axis that goes straight from Gwanghwamun to the heart of Goyang and Ilsan, first as Sajik-ro, then as Songsan-ro, here as Susaek-ro, and through Gyeonggi-do as Jungang-ro. Overall, if you include the thin layer of buildings sandwiched between the railways and the road, that's a 300 m - wide band, almost as thick as the bar of the "T". The Digital Media City Station (AREX, Gyeongui Line, Subway Line 6) does connect both sides, but the whole area will boom the day a Gwangwhamun Square-like revolution helps pedestrians claim that bandwidth, critical for seamless communications. - To the West, the DMC/Sangam-dong block is separated from Daedok-dong, Goyang city by Gayang-daero / Deogun-ro (8 lanes). And to the East, Jeungsan-ro (8 lanes) and Bulgwangcheon stream (3 bridges) mark the frontier with Songsan-dong / Jung-dong, Mapo-gu. The T-shaped DMC in the Sangam-dong trapezoid. These vertical connectors (W/E) anchor the whole neighborhood to Western Seoul's two main entry points by road: Gangbyeon Expwy and Susaek-ro (S/N). They also reach across the river: Gayang-daero leads to Gayang-dong, Gangseo-gu, via the Gayang Bridge, and Jeungsan-ro will be prolonged southwards by the World Cup Bridge to Yeongdeungpo-gu (see "A World Cup Bridge for 2015"). Doubled with the Subway Line 6 loop, Jeungsan-ro also links the DMZ to the northernmost parts of Seoul : Eungam, and beyond, Yeonsinnae, Eunpyeong New Town, or Tongil-ro. To reach the Gangnam half of Seoul by rail, you have to reach Subway Line 2, or use the AREX (the future Magok District will only be one station away when Magongnaru Station opens). - Eastwards, three 4-to-5-km-long "pins" of this plug reach deep into Mapo-gu: the three avenues that support the DMC's "T". At the top, the narrowest and shortest (Seongam-ro / Yeonnam-ro, 4 lanes) follows the lower Gyeongui Line until Donggyo-ro. That's the top of the bar. The other two go all the way to Yanghwa-ro: until Hongdae (Worldcup-bukro, 8 lanes), and Hapjeong (Nanjido-gil / Worldcup-ro, 6 lanes). 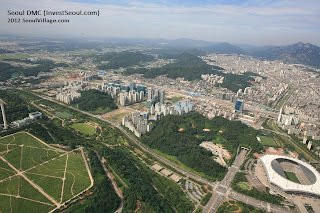 An 2012 areal view of the DMC (fished from InvestSeoul.com). In the bottom half of this picture, we clearly see from left to right Haneul Park, Mebongsan, Jeungsan-ro and its Jeungsan Tunnel, and the World Cup Stadium. Songdo is already alive and kicking. At the feet of most residential buildings, fleets of kid bikes tell the story of families enjoying fun time outdoors, and the city stretches only over 6 square kilometers at its core, so everything is within walking distance. The map can be easily memorized with its grid and functional blocks, and green areas cover a very significant proportion of the land. Smart details make life easier, for instance to cope with parcels when you're not home for the delivery, or to manage waste and energy... Citizens are confident that future commercial hubs (first around Lotte Mall, then North of Central Park) will boost the whole community. But this dream city looks a bit too sanitized, the urban planners' storytelling too polished and far-reaching. Humans look a bit like extras on a giant stage where the roads are too wide, and the skyscrapers too tall, waiting for directions from above. Everywhere you can read the script for the land, but it's as if the actors expected a play to be written for them as well. I love to walk in cities but between these neverending blocks I feel frustrated. And why surelevate this park? Pedestrians can only see inside when there's an entrance, unlike in say Yeouido's central park, where the whole neighborhood can enjoy the show, not just those who are inside, or above, watching from their penthouses. There are buses on the streets, but very few bikes or taxis. I didn't expect Masdar City's Podcars, but at least a vision for the future, a comprehensive and innovative strategy for transportation. 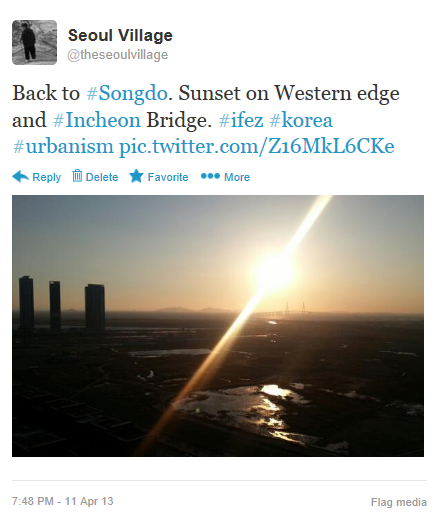 Overall, Songdo reminds me of urbanism from the 1950s, a "modern" vision of a functional American city where cars rule. There's even a Niemey'air of Brasilia - doesn't this Central Park's "Tri-bowl" echo Oscar's famous Congresso Nacional building? I remember being already disappointed by the master plan years ago, then when the first residential districts were delivered, in the mid-naughties. Only Canal Walk emerged as a potentially alleywayish element added to this very classic new town, but occupancy remains low due to delays in the developments around the structure. More heterogeneous, the DMC mirrors the rest of Seoul. A significant part of Sangam-dong, in the Eastern half of the bar of the T, has not even been redevelopped. It includes the neighborhood's citizen center, and a few individual houses, but mostly consists of 3 to 5 story buildings. With Nuritkum Square at its crux, the Western half of the bar is marked by the curve of a "Digital Media Street" whose unfinished northern side has long been euphemized as an "art fence". This is certainly not a beautiful city or a model of urbanism, but it's somehow "softer", more convenient for pedestrians. Even if you have to cross a a wide road here or a railway there, the neighborhood is more at the human scale, the architecture less pretentious. Can it be fakely disruptive at times? Yes. Are we spared the usual "apateu" blocks? No. You're simply in a Seoul neighborhood with a decent green-to-concrete ratio, and an obvious 'business' purpose, not in some exclusive complex. After all, the DMC is not Sangam's only star: more Seoul citizens know the neighborhood for its World Cup Stadium, and many have if not visited at least seen the park and its wind power generators from the expressway. 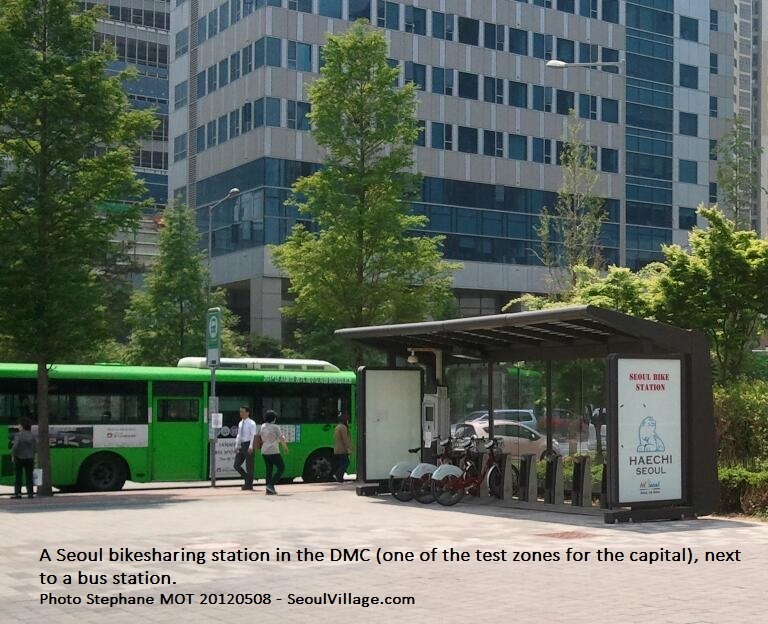 The DMC is one of Seoul city's two test areas for bikesharing services. Well located next to a bus station, this station is fully operational on this beautiful May 2012 day: 7 of the 10 bicycles are being used. For the DMC as well as for Songdo, and regardless of the conceptual successes or failures, planners focused on sections of space. Timing and sequencing seems to have resulted from constraints rather than from a strategic vision of the city. But for cities, time is of the essence. And planners should make sure they've got the dynamics right from the start. And for us, that will be the final part of this focus. * even if the Naebu Expressway starts at its gate. It covers Hongjecheon (see "Along Hongjecheon, my way or the highway"), which Bulgwangcheon joins at the corner of Pyeonghwa Park, at Nongsusansijang-ro. 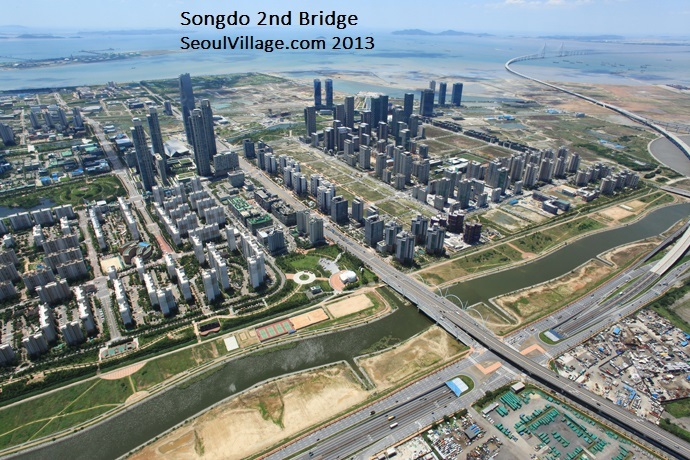 **** reminder: if Songdo was built from scratch, the DMC was partly built over trash.